(2) ... which is always right-handed. (3) The diameter of the thread lies between the bounds of 0.08 and 0.12 mm. (4) The pitch of the thread seems to roughly equal its diameter. One may wonder why the features (1) to (4) were neither included into the diagnosis of the species in  nor had been noticed by others. Fig.1: Nematoplexus rhyniensis, detail from image in , probably of the type specimen in . Width of the picture 0.35mm. Fig.2 (below left): Nematoplexus from own sample Rh9/86, natural fracture face with wound filaments seen within the chalcedony, resembling those in Fig.1 except for their size. 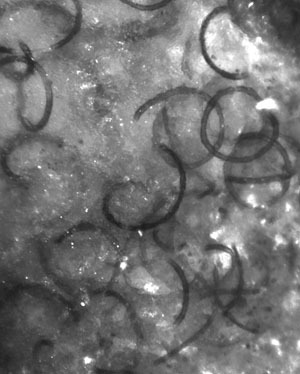 Width of the picture 0.7mm, note that this is twice the width of Fig.1. The present sample, too, does not contain land plants but the green alga Palaeonitella instead, also the aquatic crustacean Castracollis, which has been repeatedly found recently together with flooded land plants. (See Rhynie Chert News 24, 34, 43.) The present specimen of Nematoplexus (Figs.2-4) has been discovered by inspecting the smooth surface of a chert layer fragment of 0.28kg. 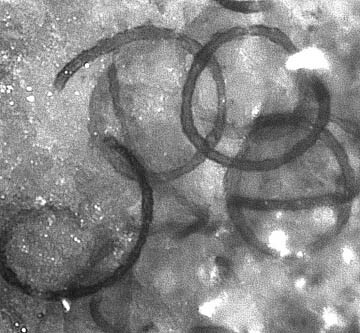 The typical coils and "branch-knots" described in  are scattered here over a patch of about 5mm across, which is probably not representative of the whole. Figs.3,4 (right): Details of this Nematoplexus specimen, same magnification as Fig.1. Note that the tube below right in Fig.3 does not dive below the other one as it might seem: It comes out of the surface and thus is not seen where it had been placed over the other one before it was removed by the crack which created the surface. Considering this, one sees three wound tubes with right-handed thread. Four such tubes, beside a few odd ends, are revealed by careful inspection of Fig. 4. As seen in Figs. 2-4, this specimen, too, shows the feature of right-handed thread. By taking into account the foreshortening of the coils in these pictures, it appears that the feature of pitch roughly equalling thread diameter is also realized here. What distinguishes the present specimen from the type specimen of Nematoplexus rhyniensis in  is the conspicuously larger structure size. Among the often numerous regularly wound tubes, or scattered throughout the same chert sample, there may be irregularly curved ones with annular or spiral wall thickenings. They have not been considered here. With the presently sparse fossil evidence of Nematoplexus it seems not justified to regard the bigger variety as a new species. This may be reconsidered as soon as more finds revealing other details become available. The sample Rh9/86 had been first presented on a friend's website where it is still seen . For recent observations on the same sample see Rhynie Chert News 51, 106. The statement in  that "Nematophytes appear to generally comprise networks of intertwined spirally coiled tubular cells" is clearly not true: All other nematophytes found hitherto in the Rhynie chert do not have spirally coiled cells: See Rhynie Chert News 1, 13, 30, 35, 36, 38, 40, 46, 98, 99. Apart from the Rhynie chert, other nematophytes, too, do not seem to have spirally coiled cells, hence Nematoplexus seems to be the only species with this peculiarity. Addendum 2016: Meanwhile, Nematoplexushas been found in three more samples. The above table has been extended accordingly. Note the variety of tubes in the sample Rh15/79. Weakly curved tubes of Nematoplexus have been discovered recently among the screw-like ones: See Rhynie Chert News 51, 71, 102. They have not been included into the above table. 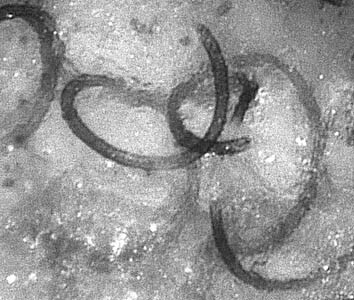 Annotation 2018: The suggestion in , Nematoplexus "may represent the permineralized equivalent of Nematothallus" is certainly not true. 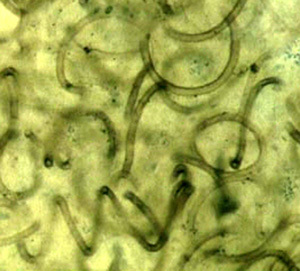 The unique and distinctive feature of Nematoplexus, the screw-like wound tubes, have not even been mentioned in . The alleged branch knot in , Fig.6.10, does not show any similarity with the various branch knots found in own samples, see Rhynie Chert News 126. The tubes of Nematoplexus in , Fig.6.9, are much too large. A.G. Lyon: On the fragmentary remains of an organism referable to the nematophytales, from the Rhynie chert, Nematoplexus rhyniensis. S.R. Fayers, N.H. Trewin: A review of the palaeoinvironments and biota of the Windyfield chert. Trans. Roy. Soc. Edinburgh Earth Sci. 94(2004 for 2003), 325-39. T.N. Taylor, E.L.Taylor, M. Krings: Paleobotany, Elsevier 2009, p.183.